The MoIC recently released the 2010 Annual Statistics Bulletin. 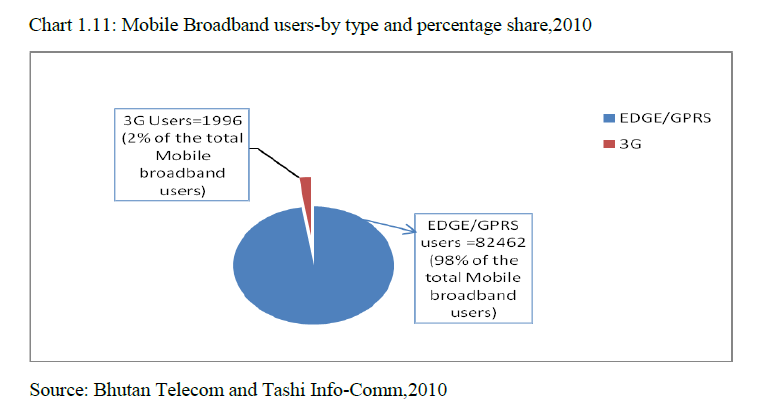 According to the bulletin, there were 84,458 mobile broadband subscribers in Bhutan in 2010. This figure has also been reported by the Kuensel. Mobile Internet technologies include GPRS (very slow), EDGE (slow) and 3G (sometimes fast). The latter is only available in Thimphu. Out of the 84,458 subscribers, the bulletin reports that around 2% (1,998) are 3G subscribers, and the other 98% (82,462) are GPRS/EDGE users. So are there 84,458 mobile broadband users in Bhutan? This number represents around 30% of B-Mobile customers, and from empirical observations, I find it highly unlikely that 3 out of 10 phone-owners use their phone to browse the Internet. My guess is that the figure represents the number of GPRS/EDGE-provisioned customers, which can loosely be translated into "mobile internet subscribers", but not the actual number of users - people using their phone or data card to connect to the Internet. The question is: How many B-Mobile subscribers actually pay for data usage?